Rotterdam (NL), January 22, 2019: In A Fisherman’s Tale, the mind-bending VR adventure game that launches onto PlayStation VR, HTC Vive, Oculus Rift and Windows Mixed Reality headsets today, you will work with infinite, ever smaller and bigger replications of yourself to find your way out of a world where physics are utterly broken. What does it mean to be trapped inside a replica in an elusive virtual world? A Fisherman’s Tale is a journey of both introspection and extrospection, asking players to both reach inside and outside of themselves for answers. Break more than a couple laws of physics in mind-bending VR puzzles! Team up with yourself in revolutionary multi-dimensional single player co-op! Use your hands to pick up, throw, combine, and use all kinds of things in glorious fully immersive virtual reality! Toy around with your tiny little model lighthouse, inside a lighthouse, inside a... is that another lighthouse? A Fisherman's Tale is now available at a SRP of $14.99/€14.99 for PlayStation VR, HTC VIVE, Oculus Rift and Windows Mixed Reality. 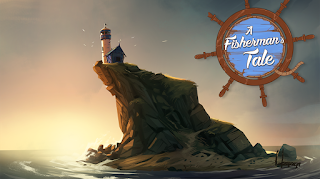 For more information, visit http://afishermanstale-game.com.